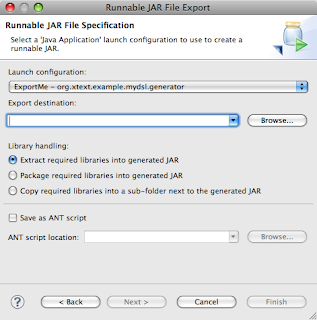 Sebastian Zarnekow's Blog: How to Deploy Xtext to a Headless Plain-Java Environment? I have long mileage on Maven, how to create single jar files, details of MANIFEST.MF, etc but near zero on tricky details of Eclipse platform. The problem I had when I executed the passes you pointed out is that there's no mainClass in the generated MANIFEST.MF created in the exported JAR file. 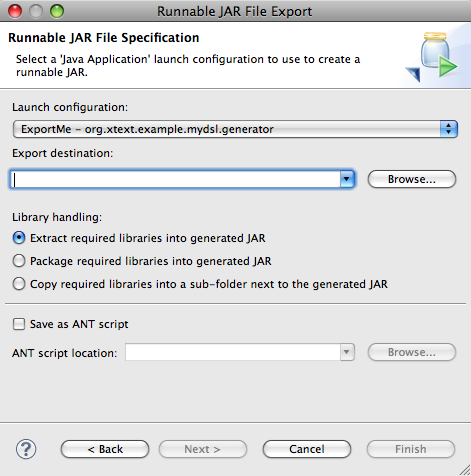 Due to this reason, I'm not able to run it with the "-jar" option, like you pointed out. It 'works' if I employ "-cp" option and I mention the Mwe2Launcher class name explicitly. Do you have any idea of what the cause it would be (for a missing mainClass in the MANIFEST.MF file) ? I suppose that it would be due to the fact I'm also using m2eclipse, i.e: I have my pom.xml file and I have some dependencies (which are properly packaged by Eclipse!). This is my answer to myself so that more people could benefit. 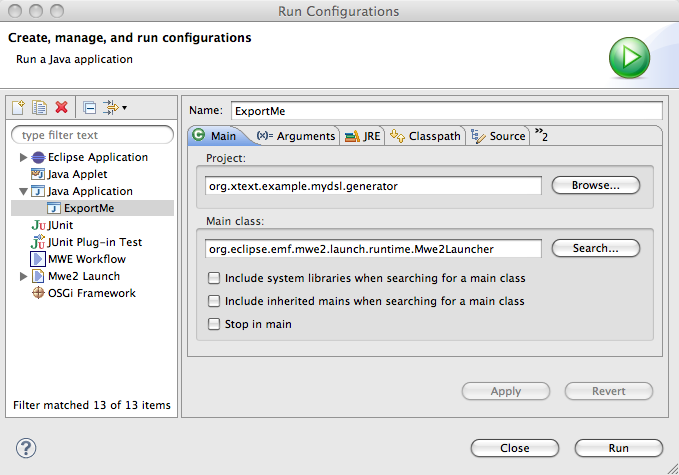 Seems like Eclipse Exporter integrates somehow with m2eclipse. It means that dependencies specified in your pom.xml file are packaged as long as dependencies specified in the /META_INF/MANIFEST.MF file (which is a resource needed by Eclipse plugins; do not confuse with mundane MANIFEST.MF files). Thanks for providing the answer as a follow up. Could not find main method from given launch configuration. Accordingly, the generated JAR file doesn't work. 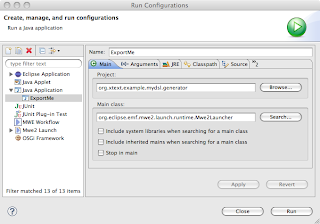 The Mwe2Launcher has been correctly selected in the Run Configuration and I can see that it has a main() method. So, the trick is to add a plugin.properties to the generated .jar file that fixes the problem. I use 7zip to add a .properties file. "Copy the required file into a sub-folder next to the generated JAR"
@Tobias I'm afraid I've no idea why this fails. Could you provide a small reproducable example so I can have a look at it? @Michael Thanks for sharing this. I attempted to use this method, but I ran into some issues. I first ran into the issue mentioned already about the main class not being accessible and needing to use java -cp instead of java -jar. Is there something which I missed?